Watching starling murmurations as the birds swoop, dive and wheel through the sky is one of the great pleasures of a dusky winter's evening. From Naples to Newcastle these flocks of agile birds are all doing the same incredible acrobatic display, moving in perfect synchrony. But how do they do it? Why don't they crash? And what is the point? Back in the 1930s one leading scientist suggested that birds must have psychic powers to operate together in a flock. Fortunately, modern science is starting to find some better answers. To understand what the starlings are doing, we begin back in 1987 when the pioneering computer scientist Craig Reynolds created a simulation of a flock of birds. These "boids", as Reynolds called his computer-generated creatures, followed only three simple rules to create their different patterns of movement: nearby birds would move further apart, birds would align their direction and speed, and more distant birds would move closer. Some of these patterns were then used to create realistic looking animal groups in films, starting with Batman Returns in 1992 and its swarms of bats and "army" of penguins. Crucially this model did not require any long-range guidance, or supernatural powers – only local interactions. Reynolds's model proved a complex flock was indeed possible through individuals following basic rules, and the resulting groups certainly "looked" like those in nature. Scientifically-accurate bat behaviour in Batman Returns. From this starting point an entire field of animal movement modelling emerged. Matching these models to reality was spectacularly achieved in 2008 by a group in Italy who were able to film starling murmurations around the rail station in Rome, reconstruct their positions in 3-D, and show the rules that were being used. What they found was that starlings sought to match the direction and speed of the nearest seven or so neighbours, rather than responding to the movements of all of the nearby birds around them. When we watch a murmuration pulsate in waves and swirl into arrays of shapes it often appears as if there are areas where birds slow, and become thickly packed in, or where they speed up and spread wider apart. In fact this is largely thanks to an optical illusion created by the 3-D flock being projected onto our 2-D view of the world, and scientific models suggest that the birds fly at a steady speed. 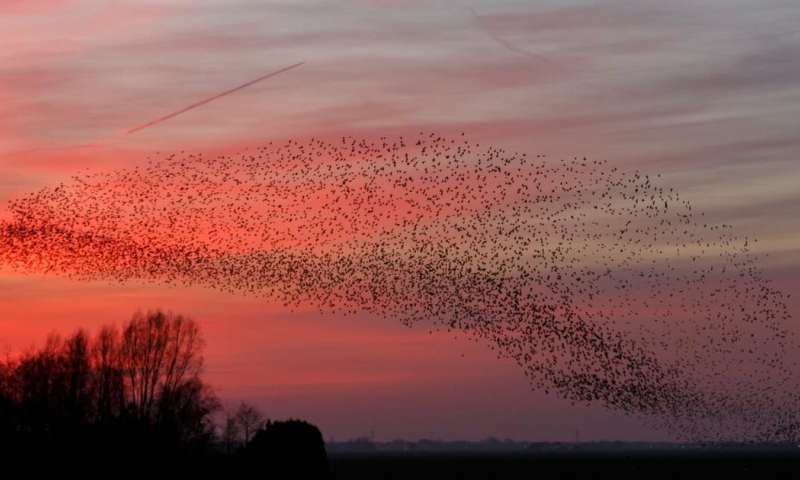 Thanks to the efforts of computer scientists, theoretical physicists and behavioural biologists we now know how these murmurations are generated. The next question is why do they happen at all – what caused starlings to evolve this behaviour? One simple explanation is the need for warmth at night during the winter: the birds need to gather together at warmer sites and roost in close proximity just to stay alive. Starlings can pack themselves into a roosting site – reed beds, dense hedges, human structures like scaffolds – at more than 500 birds per cubic metre, sometimes in flocks of several million birds. Such high concentrations of birds would be a tempting target for predators. No bird wants to be the one that a predator picks off, so safety in numbers is the name of the game, and swirling masses create a confusion effect preventing a single individual being targeted. 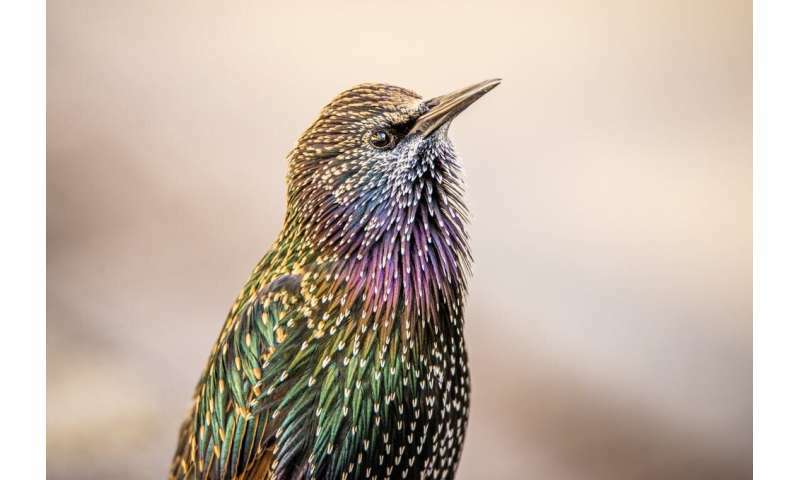 However, starlings often commute to roosts from many tens of kilometres away, and they burn up more energy on these flights than could be saved by roosting in marginally warmer places. Therefore the motivation for these colossal roosts must be more than temperature alone. Safety in numbers could drive the pattern, but an intriguing idea suggests that flocks may form so that individuals can share information about foraging. This, the "information centre hypothesis", suggests that when food is patchy and hard to find the best long-term solution requires mutual sharing of information among large numbers of individuals. Just as honeybees share the location of flower patches, birds that find food one day and share information overnight will benefit from similar information another day. Although larger numbers of birds join roosts when food is at its scarcest, which seems to provide some limited support for the idea, it has thus far proven extremely difficult to properly test the overall hypothesis. Our understanding of moving animal groups has expanded enormously over the past few decades. The next challenge is to understand the evolutionary and adaptive pressures that have created this behaviour, and what it might mean for conservation as those pressures change. Possibly we can adapt our understanding and use it to improve the autonomous control of robotic systems. Perhaps the rush-hour behaviour of the automated cars of the future will be based on starlings, and their murmurations.